Easter | How can I recycle this? How can I reuse or recycle plastic tablecloths? After last month’s straw placemats and coasters post, I got thinking about plastic “disposable” tablecloths – the type people buy as a cheap way to decorate their table for children’s (and other) parties. They’re usually thin sheets of plastic, either brightly coloured or covered with character pictures – so they seem like ideal candidates for upcycling — any specific ideas? 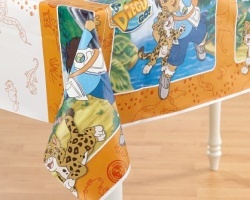 They’re also good as table/floor/everything covers for during messy crafts sessions – or use a no sew poncho pattern to turn them into splash-proof ponchos for very messy art activities! Of course, it would be better to reduce in the first place – buy multi-purpose washable textiles or easy-clean oilcloth ones. Or if you don’t want a bunch of 5 year olds to ruin your best linen, cover tables with cheap blank newsprint/sugar paper and let the kids decorate it themselves — the best bits can be cut out and kept as a memento and the rest can go into your paper recycling. As for actually recycling plastic ones, they’re usually made from HDPE (resin code 2) like carrier bags – so can be recycled alongside shopping bags. Any other ideas for reusing and upcycling them? 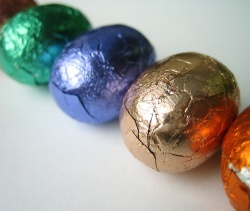 How can I reuse or recycle excessive Easter egg packaging? How can I reuse or recycle … shiny chocolate wrappers? How can I reuse or recycle … wire egg dippers? 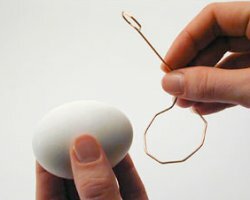 How can I reuse or recycle wire egg dippers? What can I make with the wire dippers in the PAAS egg dying kit? I have a whole bag of them.. how can I recycle these? Maybe offer them to a local school for them to use at Easter? I’ve never dyed eggs so I don’t know how strong they are but could they be made into little hanging pen pots? Nail/push-pin the hoop to a wall/noticeboard/cubicle and clip pens onto the ring – or stitch a small fabric pouch onto the ring to drop pencils into? This isn’t a real post just an advert for those who are currently feeling slightly sick after eating too much chocolate this morning. We covered excessive Easter egg packaging last year but are still keen to hear your ideas and suggestions. The cardboard can usually be recycled and the foil reused in a number of crafty ways but what about the plastic? Every year we ask people likely to buy us Easter eggs not to buy us Easter eggs but we still end up with one or two, and the packaging makes us want to cry. I have been known to wear the cardboard bit as a hat (photos available on request) so that’s that dealt with, but what can be done with all that molded yet flimsy plastic nonsense? 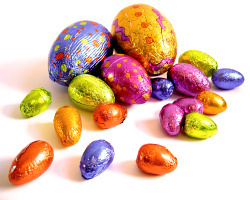 Reduce: Buy/make smaller solid chocolate instead of fragile eggs that need that packaging. Reuse: The more sturdy plastic cases can be used as paint/glue dishes during kids’ art sessions or decorating. Recycle: Check the packaging to check which type of plastic it is. Most of the plastic is PET/PETE – No 1 in a triangle – one of the most commonly recycled plastics.